The best plus size womens outdoor clothing which fits and looks good (also called extended sizing) is hard to find. Somehow, it's difficult for most outdoor gear companies to fathom that women hikers come in all ages, sizes, shapes and heights. What a frustrating experience for women who need high performance hiking clothing in plus sizes that actually fits! If you're looking for ideas on what to wear hiking, like plus size convertible hiking pants or shorts, moisture wicking shirts and sports bra, and waterproof rain pants, you're on the right page. You go into an outdoor clothing retail shop and browse through the selections of hiking pants, hiking shirts, rain gear and other womens hiking apparel and active wear. You search for your size. Big sigh, then a deep breath before you move on to the men's department, or leave the store. Please don't take the lack of women's extended sizes in hiking clothes personally. You are not alone in your quest for the best plus size womens outdoor clothing that not only fits, but functions well on hiking trips and day hikes. And someday, size inclusive hiking clothing will be a reality from every outdoor retailer. Why do I make that prediction? Because there are positive signs of improvement in some leading outdoor clothing brands, like REI Co-op and Columbia. And there are women owned stores who know that a woman's curvature needs specific sizing and technical details to fit right. Keep reading as we name some names. Don't waste any more time in frustration or anger as you shop for extended size outdoor clothing. Instead, go straight to the outdoor gear companies who pay attention to women hikers who are not served by the size range that most hiking clothes are designed for in the U.S. (which seems to be up to size 14 or so). Let them know that your needs exist. And don't be shy about sending them feedback and posting reviews of their products. Hitting the trail isn't a privilege for women "of a certain size", right? Hiking clothes for plus size women needs to become the norm, not the exception. REI Co-op continues to add options every season, most in the 1X to 3X range, and you can get an overview of their selection here. More to love about REI: When you become a member (one time $20 fee), you receive a 10% rebate on your annual qualifying purchases. Read more about the REI Co-op member rewards here. SkirtSports offers an exclusive line of clothing designed and tested by women who wear 1X, 2X and 3X. They call it their Move Without Limits line! Now, let's zoom in for a closer look at examples of plus size womens outdoor clothing that work well on the trail. Columbia makes hiking pants in sizes ranging from 16W to 24W, like these Just Right Straight Leg Pants. Non-convertible pants are great for hiking when rain is more than a distant possibility. The waist band is adjustable. This fabric stands up to trail debris and mud. Here's the thing about these pants: there's only one little zippered pocket. Some women hikers don't like pockets, so if you're a pocket scoffer, these are for you! Convertible pants (lower legs zip off fast to convert to shorts) in two different length options, called the Saturday Trail pants. If you'd prefer knee length trail pants in this style, here they are! Heading out on chilly trails in the fall? Works great for springtime hikes, too. REI also offers waterproof rain pants at various price points. These pants pack down small until you need them. The elastic waistband with draw cord allows you to accommodate your clothing layering system. The zippered leg vents mean you don't have to take off your boots to get these pants on when you feel the first rain drops. The right pair of rain pants can make or break a hike, so match them to your hiking plans. This pair has more technical features to stand up to rugged weather, and thus a higher price point. Read my review for all of the reasons why I wear them year round. has been around a long time! L.L. Bean makes these Comfort Trail Pants. These are also available in a cropped version, if you'd prefer your calves to be unencumbered in warmer hiking weather. Be sure your underwear plays nicely with your hiking pants. Get a few ideas for the best hiking underwear to wear under your pants and shorts here. Would you rather hike in shorts? Read this for ideas on how to size up, and locate, a great pair of womens hiking shorts in your size. Here's a great example of a trailworthy pair of hiking shorts. This Sahara long sleeved shirt gives you stretchy fabric (nylon plus spandex), ventilation with quick dry underarm panels, and sleeve versatility. Five color choices, so you can have one for every hiking season and then some. This shirt is going to work hard for you on the trail, and look good, too. Columbia's extended sizing options to the rescue again! Need a base layer for cool weather spring and fall hikes? This SmartWool merino crew has long sleeves and its midweight makes a great addition to your clothing layering system. It goes well with that Silver Ridge shirt above! When warm weather hiking trails beckon you, you want to stay as cool and dry as possible while working up a sweat gaining that view point or campsite. Here's a nice scoop neck option from Nike, with Dri-Fit moisture wicking fabric and a nice sleeve length for a summer hike. Love that true blue color, but it's also available in a soft teal and a goes-with-anything gray, in sizes 1X - 3X. For great choices in tank tops, check out these SkirtSports options. This woman owned and operated company not only designs active clothing with the female body's curves in mind, they allow hikers and runners to test their styles. The Breakaway tank offers a V neck and soft jersey fabric for moisture wicking freedom of movement, plus full back coverage to prevent chafing from your backpack. The wide shoulder straps are compatible with a hiking backpack. Here's another option for a tank top made for the trail. The Eclipse shirt features a v-neck and racerback style. The wicking fabric, and longer length (prevents chafing from your backpack's hip belt) will also be appreciated on the trail. Not everyone is on board with hiking in a skirt. If you are a fan of leg freedom, you have some mighty fine options for the trail. The Free Flow skirt you see here is offered in three different prints, sizes 1X - 3X. You will appreciate the built in shorts when you bend over to pick up your water bottle, and the moisture-wicking lightweight fabric works hard for you on warm weather hikes. Need a supportive yet comfortable plus size sports bra under that shirt? This bra is available in 40DD through 42E, and will eliminate the need to double up on flimsy sports bras when you hit the trail. Want more options for a great hiking sports bra? You deserve high performance technical hiking clothing that fits and looks great. Hopefully the ideas on this page will help you find it. 1. Don't be discouraged if your size and fit is hard to find in hiking attire. Your desire to hit the trail will motivate you to keep hunting for hiking clothing that works as hard as you do to get you to some great outdoor destinations. Get out there and climb that hill! 2. 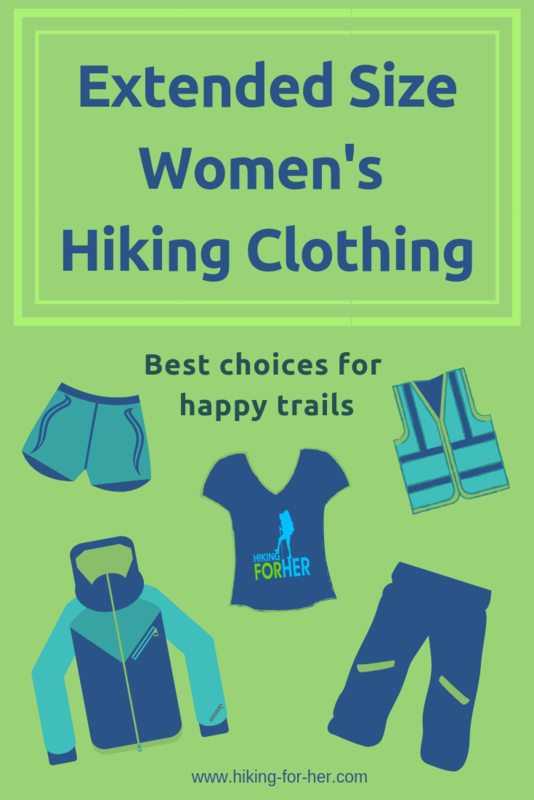 Start by looking at the styles and companies mentioned here, because lots of other hiking women have recommended them. 3. Look at Juno for a full line of womens active wear in your size, too. 4. Send me your questions about plus size hiking, and I'll be happy to answer them. Just use this CONTACT link. Lots more extended size hiking clothing options here, too. She’s been on a hiking trail somewhere in the world for nearly five decades, and loves to share her best hiking tips right here. 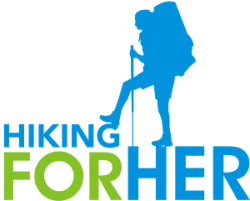 Would you like to support Hiking For Her's mission to get women of all ages, sizes and abilities onto hiking trails? Purchase your outdoor clothing through the links on this page, and a small amount of money flows into HFH's coffers to keep the hiking tips flowing freely to you.